Yelagiri or Elagiri is a small hill station located in between the towns of Vaniyambadi and Jolarpettai (Tamil Nadu, India). The hill station dates back to the British colonial days. "The Whole of Yelagiri was once the private property of the Yelagiri Zamindar Family. It was taken over by the government of India during the Early 1950s. The house of the Yelagiri Zamindars still exists in Reddiyur." Fr. Francis Guezou of Don Bosco, worked for the uplift of hill tribals. He has been the main reason for the educational upliftment to the people of Yelagiri. The Yelagiri hill station is not as developed as other hill stations in Tamil Nadu like Ooty or Kodaikanal. However, the district administration has now taken up the task of developing Yelagiri Hills into a tourist destination by promoting adventure sports such as paragliding and rock climbing. Yelagiri is one of the famous places for trekkers in India. The hill station is located at a height of 1410.6 meters above sea level. Yelagiri comprises 14 hamlets and a number of temples spread over several hills. The highest point in Yelagiri is the Swamimalai Hill, standing tall at 4,338 ft; Swamimalai is a destination and viewpoint for trekkers. The hill provides a number of trekking trails through thick reserved forests. Mangalam, a small village, is at the base of this hill. There are other trekking options that include smaller peaks like Javadi Hills and Palamathi Hills. Yelagiri Hills is home to hundreds of snakes. Yelagiri's climate is very very Cool in Monsoon Season .pleasant Weather daily Occurs in This Hill Station. classified as tropical. In winter, there is much less rainfall than in summer. This climate is considered to be Aw according to the Köppen-Geiger climate classification. Human settlement started 200 to 400 years ago. Most of the native people are 'Vellala caunter' or 'Malayali' (not to be confused with Malayalees). Malayali denotes people who live in mountains. Malayali people also called as "karalar" which means 'one who rules the clouds'. Malayali people claim to come from plains, they are from the Kancheepuram district. The retreating 'Vellala caunter' (a group of cultivators) from the warring soldiers of Tipu Sultan's army in the seventeenth century made the plateau of Yelagiri their home. Another native tribal groups are the Irular. Most of the Tamil people are Hindus. They commonly worship Shiva in the name of 'Nachiappan' and Parvati in the name of 'Nachiamma'. A temple for Murugan (son of Shiva and Parvati) was built in the 1960s. Recently more Churches were also established by the Christian missionary. Mosques are also available in the area. Earlier only a few Christian missionary schools were available for primary school education, but now more Residential schools have come up in this region. Educational Institutions: There are schools in the various hamlets around Elagiri including the Government School and St. Charles School which are primarily for day scholars. There are also three residential schools - Ebenezer Matriculation and Higher Secondary School (Residential), Peace Garden Matriculation School and Samaritan Residential Schools. The Don Bosco has recently started an Arts and Science College for the benefit of local community. Fr. Francis Guezou started a boarding for boys. Don Bosco Boarding House with 170 students. This is the first institution of Fr. Guezou on the hills. He wanted to gather the children around him and give them good education. Boys from I std to XII std, are staying here and attending school at St. Charles School. BICS InfoTech, with 350 students and trainees. This work makes real Geuzou’s dream of providing higher education with employment for the underprivileged young people. Mr.Maria Leo Francis,Fr.Maria Arockia Raj, Fr. Thaddeus with a similar thought met Fr. Guezou and then this great dream of BICS became real. In 2013, BICS has got approval of running a regular college, and Don Bosco College is providing good education on hills. The famous Yelagiri Summer festival celebrated in May end is organised by the Tamil Nadu Tourism Development Board. Stalls from different departments, Flowers show, Boat house various cultural programs and Dog Show with a variety of dog breeds are conducted every year. People from all over the State and other parts of the country participate in this annual festival. Nature Park: A Park was established in the year 2008. It consists of an aquarium, rose garden, an artificial water fall, and a musical fountain. Punganoor Lake Park : It is one of the most popular landmark in Yelagiri Hills. It is an artificial lake 25 feet deep with an adjoining park. Jalagamparai Waterfalls: A short distance away, on the other side of the hill, is Jalagamparai falls,Situated at a distance of 14 km from Tirupattur. The murmuring Attaru river flows through the Yelagiri Hills, and plummets down to form a highly captivating waterfall. It's an hour, 5 km, walk from Yelagiri downhill. Though there is a direct route from Yelagiri to the falls, it is often closed. One has to go all the way down the hill, take the plains, and then climb the hill on the other side. It's an hour's journey. Swami Malai Hills: Swami malai hills are the hills in the shape of cake with a strong base at the bottom and a high peak. Trekking is an attraction at Swami Malai hills. This trek leads one to a small peak from where the entire valley is visible. Telescope observatory: A telescope observatory near Yelagiri hill was also of attraction to visitors. It has now been shut down. Sri Sathya Ashram - THE KEY FOR YOU : Open only on Pournami and Amavasya days...Only the destined can set their foot into this Ashram...In the Nilavoor Road. 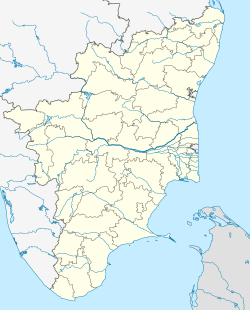 Wikimedia Commons has media related to Yelagiri. ^ "Miles to go for Yelagiri Hills as a tourist spot". The Hindu. 25 May 2008. Retrieved 19 January 2019. ^ T. Pullaiah; Rao Muralidhara; D. Muralidhara Rao; K. Sri Ramamurthy (2002). Flora of Eastern Ghats: Hill Ranges of South East India. Daya Books. ISBN 9788187498490. ^ "Yelagiri hills, for paragliding". The Hindu. 20 August 2008. Retrieved 19 January 2019. ^ "Yelagiri Mahashakti". www.mahashakthi.org. Retrieved 2019-04-15. Wikivoyage has a travel guide for Yelagiri.